Blackjack is already well known in the casino community as being a great game in terms of the house edge, but the super popular Microgaming offering Double Exposure Multi-Hand Blackjack, may just give players an even greater advantage. The name of the game is taken from the fact that in this popular game, both the dealers pocket cards are exposed before the player makes their decision about what to do with each hand. Therefore, if you see the dealer’s pocket cards are valued at 18, you know that if you have 17 or below, you need to hit otherwise you’ll lose. Similarly, if the dealer has cards worth 12, you’ll know they will have to hit on their next hand and risk going bust, thus giving you the decision whether to stick on hands from 13 through to the magical 21. What is great about this version of the game is that it is quick and easy to play with a single player able to play up to five hands against the dealers one, meaning that if the dealer busts, then you can win back double your stake on each successful hand you play. Of course, the player being able to see the dealer cards offers a huge advantage to the player so to redress the balance slightly, players cannot take out insurance against blackjack, tied scores between the dealer and player result in a dealer win (unless it is on blackjack) and a player cannot use a surrender option. The graphics are beautifully realised and the game plays very speedily, with the autoplay option allowing you to sit back and enjoy the game and the strategic element without having to ante up continually at the end of each hand. 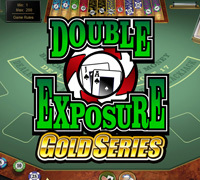 Double Exposure Multi-Hand Blackjack is a fantastic game with lots to offer and gives players an exciting new way to play a tried and trusted casino classic.